Here is the list of the hotels near Niederhaslach. Book your hotel near Niederhaslach today, Monday 13 May for the best price, reservation and cancellation free of charge thanks to our partner Booking.com, leader in on-line hotels reservation. Below here is the list the 50 closest hotels of Niederhaslach, sortable according your criteria. You will find the position of these accommodations on the Niederhaslach hotels map. Guest accommodation Boersch Preferred hotel ! Situated in Boersch, this holiday home features free WiFi, a spa bath and a terrace with mountains views. The unit is 9-minute drive from Obernai. Free private parking is available on site. There is a dining area and a kitchen complete with a dishwasher, an oven and microwave. Towels and bed linen are offered in this holiday home. Other facilities at LE GALLUS include a hot tub. Many activities are available in the surroundings including hiking, cycling, fishing and bocce. 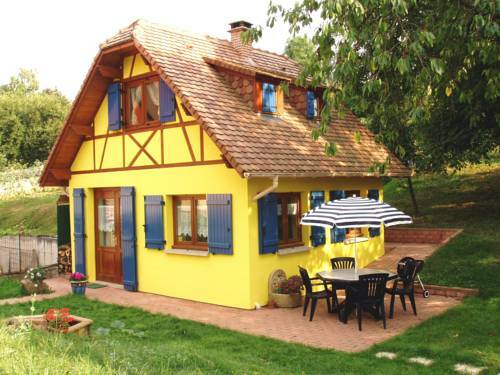 Colmar is a 40-minute drive from LE GALLUS, while Strasbourg is a 30-minute drive away. Strasbourg International Airport is 16 km away. Located within 11 km of Mont Sainte Odile in Ottrott, Les Chambres Chez Christine provides accommodation with free WiFi and flat-screen TV. Some units have a terrace and/or balcony. A continental breakfast can be enjoyed at the property. Guests at the bed and breakfast can enjoy skiing nearby, or make the most of the garden. The nearest airport is Strasbourg International Airport, 30 km from the property. Located in the village of Ottrott, the Hostellerie Des Châteaux & Spa is between Strasbourg and Colmar, on the Alsatian Wine Road. It features a 1000 m2 spa centre and a counter-current pool with massaging hydro-jets. The spa facilities include 6 different saunas and hammams, several resting rooms with water bed and a range of massage and organic body treatments. A fitness room and a hot tub are also available. The air-conditioned rooms, suites and apartments at the Châteaux and Spa have a flat-screen TV with Satellite channels. Some have a balcony and view of the forest or the Plaine d’Alsace. Hostellerie Des Châteaux & Spa offers 2 restaurants: Le Comptoir du Chateau with bistrot-style cuisine for lunch breaks and Le Gastronimique, a gourmet-style restaurant open at lunchtime and for dinner. Free private parking is provided, and free Wi-Fi connection is available throughout the property. Below here is the hotels map of Niederhaslach. Names and details of Niederhaslach hotels can be shown on the map clicking on the prices icons.